While there is a whole lot of truck like monstrous SUVs dominating the niche of luxury crossovers, there are SUVs like Cadillac’s amazingly loved Escalade and the SRX. The 2014 Cadillac SRX is one beautifully designed crossover to behold. How can a SUV possibly sport contours and straight chiseled lines blended so perfectly that it almost looks like a sedan while being a perfect SUV on the side? The 2014 Cadillac SRX manages to do that is a fine way. And along with the brilliantly designed exterior, which the SUV has held on to from the previous models, this year the SRX is set to sport a completely redesigned interior with newer and better features. The five passenger crossover is now upgraded with the newest safety technology and features a fully adaptive cruise control. While the beautiful lines and nimble designing on the outside is already comparable to a sedan, the interiors of the 2014 Cadillac SRX are also bold and unconventional for SUV. Seems like everything about this utility vehicle is more car like! The 2014 Cadillac SRX doesn’t drive very sporty. The stylish SUV is powered by 3.6 liter V-6 grunt that is good for 308 ponies and produces about 265 pound feet of twist. The sprint time the vehicle takes in order to reach 60 mph from rest is 7.1 seconds which is on par with SUVs in this niche. The all wheel drive SRX comes out to be a tad bit slower yet it supersedes the 7.8 seconds sprint time of the Lexus RX350. However, the all wheel drive system on the SUV is optional. 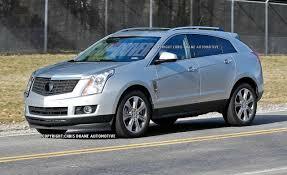 The 2014 Cadillac SRX also offers some amount of torque vectoring with the help of rear brakes. The SUV comes in front wheel drive as standard. The interior is the big thing about the 2014 Cadillac SRX. There is more sophisticated and stylish dashboard that sports all new-fangled gauges. There is an all new 8-inch CUE infotainment system. Earlier, the screen in the SRX was semi-masked until it was needed but now the vehicle sports an all time visible LCD with a classier UI and design. The new adaptive cruise control charges an extra sum of $2,400. But for all its worth, this is a must have if you settle to buy this SUV. The cruise control is capable of making the SUV stop or go in traffic. There are features like cross-traffic help and blind-spot assist. The safety features get more intensified with the additional lane assist system and safety alert seats. The bumper and the stylish grille of the SUC conceal radar arrays which are the basics of all the safety features in the 2014 Cadillac SRX. This essentially Cadillac SUV faces a generous amount of competition with vehicles like the Lexus RX450h and Lexus RX350. Both the SUVs are a delight to drive. The current Cadillac SRX, in all its glory, is priced at around $40,000; however, the price is not yet fixed for the 2014 Cadillac SRX.